1. Place the bread, cocoa, cinnamon and honey in a small food processor and blitz to make breadcrumbs. Spread out onto a baking tray and place under a preheated grill for 1 minute or until golden and crispy. Leave to cool. 2. 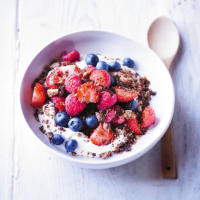 Divide the fruit between 2 bowls or glasses, top with the yogurt and sprinkle over the chocolate crunch mixture.